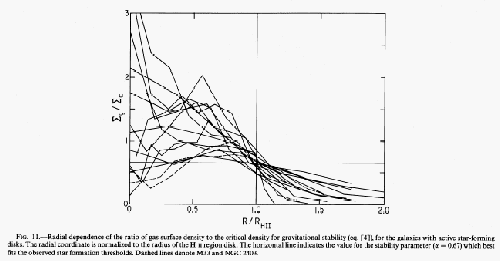 Kennicutt plotted against the normalized radius as for various galaxies, where represents the maximum distance of HII regions from the center (Fig.3.4). Since , Figure 3.4 shows that HII regions are observed mainly in the region with but those are seldom seen in the outer low-density region. This seems the gravitational instability plays an important role. Figure 3.4: vs . represents the maximum distance of HII regions from the center. The sound speed is assumed constant . Taken from Fig.11 of Kennicutt (1989). Figure: Numerical simulation of the swing amplification mechanism. The number attached each panel shows the time sequence. This is obtained by the time-dependent linear analysis. First, perturbation with leading spiral pattern is added to the Mestel disk with . 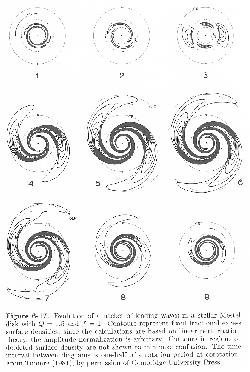 The leading spiral gradually unwinds and become a trailing spiral. Loosely wound spiral pattern winds gradually and the last panel shows a tightly wound leading spiral pattern. The final amplitude is times larger than that of the initial state. where represents the radial velocity dispersion. For non-axisymmetric waves, even if the instability grows. To explain this, the swing amplification mechanism is proposed (Toomre 1981). If there is a leading spiral perturbation in the disk with , the wave unwinds and finally becomes a trailing spiral pattern. At the same time, the amplitude of the wave (perturbations) is amplified (see Fig.3.5).